Ramzan, also known as Ramadan, is a month in the Islamic Calendar in which all the adults have to fast from dawn till dusk. This is mandatory for each and every adult barring those who are suffering from any sort of illness, or are travelling, is diabetic, breastfeeding, or pregnant or having menstrual bleeding. This month is the 9th month of the Islamic calendar and generally has 29 to 30 days. The fasting in this month is said to be one of the Five Pillars of Islam. The number of days in this month depending on the visual sightings of the crescent moon. People have been exchanging gifts with each other for a long time. The main principle behind this practice is to congratulate someone, or to celebrate, and to strengthen their relationship. It is just a token of friendship and love in such a special month. As the festival of Eid is one of the prime festivals that are observed by the Muslims all over the world, the gifts that are given should have to mean, and value to the person receiving the gift. But sometimes, choosing the right gift can be tough, as you do not know what the person likes. But do not worry, we would help you out in this matter. Choosing the correct gift for Ramzan and Eid is very important. It is the gift that shows your love and respect for the person who is receiving the gift. So choosing the wrong gift may send the wrong message. So to help you out a bit, we have given some of the best Ramzan, and Eid gift ideas for you to consider. Just glance through, and see what would be best for the person for whom you are gift shopping. If you want to gift your wife or sister, then we would recommend Imitation Jewellery Necklace Set with earrings or pendant set, rings, bracelets etc.. The second option on our list today is for married couples, which is the German Silver Items or Bedsheets. This is would make a really good impression, and would be perfect for couples. The third place on our list goes to the Designer Dry Fruit Box. 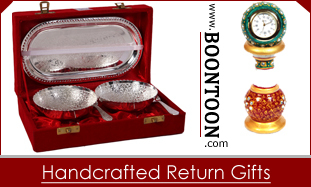 This pair of boxes are perfect for keeping dry fruits. As dry fruits are great sources of energy, and are heavily consumed during the non-fasting hours of Ramzan, this gift would be hugely appreciated by everyone. 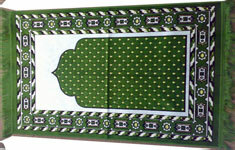 At the fourth place on the list, we decided to put the Prayer Rug. This would be a great gift for children as they would have guided drawings on the rug which will guide them through the process of praying. At the fifth place, is the Ramadan Puzzle. This would be a great eid gift for children. These puzzles have messages in both Arabic and English. 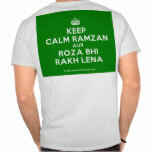 A Ramzan text t-shirt would be a good gift for youngsters. These shirts are quite fashionable, and religious at the same time. The last place on our list goes to the Ramadan Mubarak Power Bank. This would be a great gift for people who are sort of technology freaks. This power bank has ports for Samsung, Nokia, HTC, Apple, Motorola, and LG. This is a very versatile gift, and can be carried anywhere. It has a 7000mAh capacity.